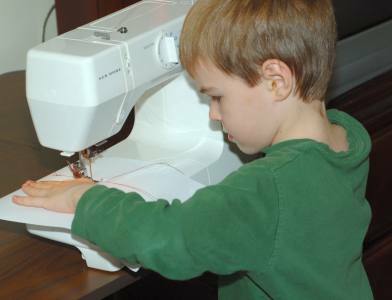 For these pre beginner sewing lessons and projects the age suggestion (7-8 years old) is just a rough guess. Each child is different, so judge accordingly. Keep in mind if you are just starting to sew, but older than the suggested age, you may want to go back and look at previous age groups. 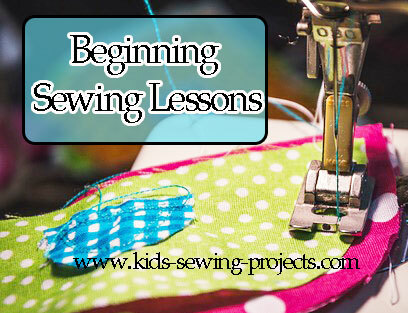 Each sewing lesson has an easy sewing project to practice the skill they learned. In the Pre Beginner Lessons Level 1 we learned some basic hand stitches and practiced hand sewing. In this level we will move up to using the machine. Keep practicing hand sewing and getting the stitches smaller and more even. Check back at Pre-Beginner Level 1 - Lesson 4 and 5. After practicing, move on to this tie belt project. Gather items of clothes that need mending. 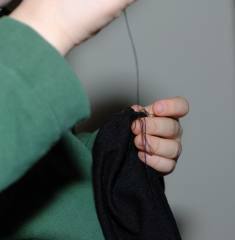 These can be simple things such as a hole in a sock or a hole in a shirt and practice mending. 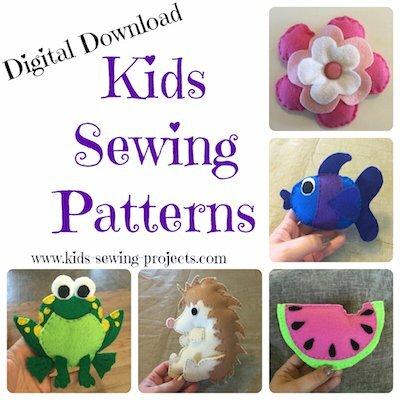 In this kids sewing lesson we will practice sewing buttons. Using a square of scrap material, sew on buttons wherever and as many as you desire. Make sure you start the needle on the back side or wrong side of the material. Bring your needle up through the hole. Pull all the way to the end. Put your needle down into the next hole. Continue several times up and down through the button holes until your button is secure. Tie a knot at the end of your thread when you are done on the back side of your material. Now try some Felt Sewing Patterns! You don't have to sew anything here just take a good look at what your sewing machine can do. Take a look at the machine manual and review what each part of your machine is. Then move on to the next lesson. 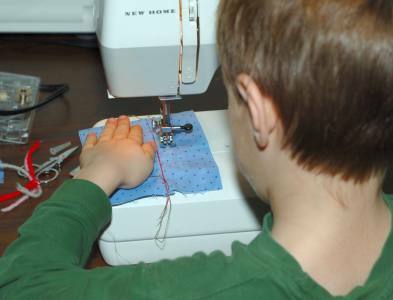 Following the sewing machine directions learn how to thread your machine. Some machines are different so it is best to follow the manual. My machine has numbers to guide the threading process. Threading a needle might be frustrating for awhile, but have them keep trying, once they get it, they'll be really proud of themselves for mastering it. *For additional safety, turn your machine off when threading. Again following your machine manual, add thread to your bobbin and thread it to the machine. The video above will help also. The video above will also show you how to thread your bobbin. Using an old needle, practice sewing, without thread on a piece of paper. Practice sewing straight lines and turning corners. Make sure you stay close by and observe your child. Make sure they keep their hands away from the needle. We have sewing templates to practice sewing lines. On a piece of scrap material, sew a straight stitch with the sewing machine. Practice as much as you'd like then move on to the next step. At this stage, we are just practicing a straight stitch not making corners or back-stitching. Use the ½ or 1/8 inch lines to the side of the presser foot to guide you. Try to stay straight with those lines. You'll need to know the backwards stitch for two main reasons. 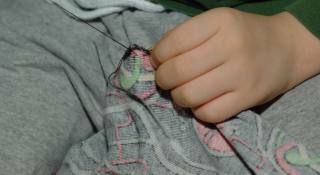 To secure your stitches, you will start sewing and then sew backwards for a few stitches. This will secure your ending stitches and keep them from coming loose. Sometimes while youre sewing youll veer off your sewing line. You need to learn the right way to get back to your sewing line. You do that, by sewing backward to where you started to veer off and then continuing forward on the correct line. Practice on your scrap material, starting on one side, making a few stitches and then sewing backwards. Continue sewing down the side and when you reach the end sew backwards again to secure your stitches. Take off and trim your lose threads with scissors. When you are sewing you will always secure your stitches this way, except in rare cases, such as the gathering stitch, that we will talk about later. Once you've practiced as much as you'd like, move on to these Pre- beginner sewing projects. For each of these projects we are not making corners at this point. Sew one side to the end, take it off, sew the next side, etc. Use cotton or cotton blend material, nothing slippery or thick at this point. Always launder your material you are using before starting your project. Use a plastic quilting ruler or tape measure to measure the exact length and width. You may find a fabric pencil helpful to draw the lines with a ruler then cutting out your project. Do you have a Pre-Beginner Sewing Project to Share? 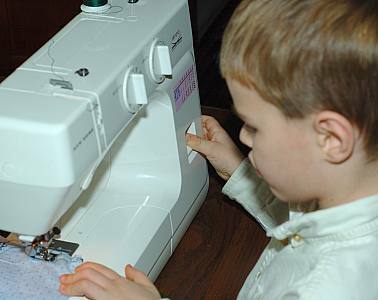 Share your kids sewing project, instructions or pictures. Take me to Level 3 online lesson from Pre Beginner Sewing.